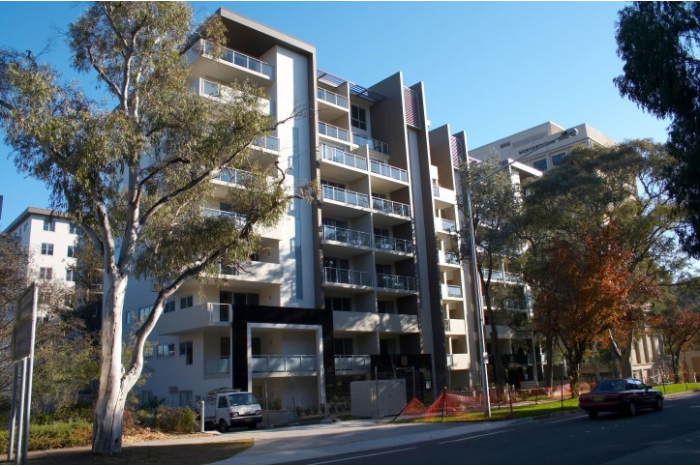 The brief for Monarch apartments outlined a requirement for 124 residential apartments, and to achieve the benefits of cross ventilation in each dwelling. This complex task was achieved in the proposal by the design of two separate towers, and the considered placement of units within the overall building layout. The apartments are a variety of 1, 2 and 3 bedroom dwellings, each with an exceptionally high standard in material fittings and finishes in both the bathrooms and kitchen. Each Apartment has two balconies, the first off the living area, and the second from the bedroom. This offers greater natural light to each apartment and evokes a greater feeling of space within. These two balconies also offer visual access from one end of the apartment to the other. Similarly the overall feeling of light and spaciousness is enhanced by an increased ceiling height of 2700mm. 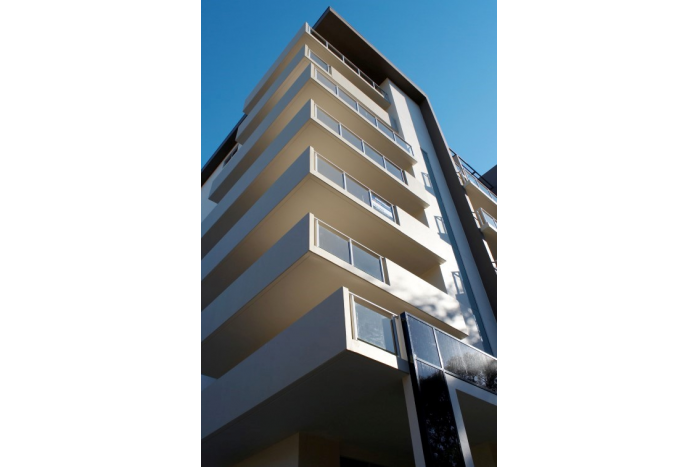 The principal quality of the balconies is their sizes, all of which are large enough for entertaining, and where possible wrap around the corners of the building to take maximum opportunity of the views of the city and surrounding hills. The access and lift design of Monarch is both unusual and innovative. Each tower holds four lifts, as opposed to two, which results in each lift servicing only two apartments per floor. Another benefit of these additional lifts is reduced corridor space, thus leaving more internal floor space for apartments. 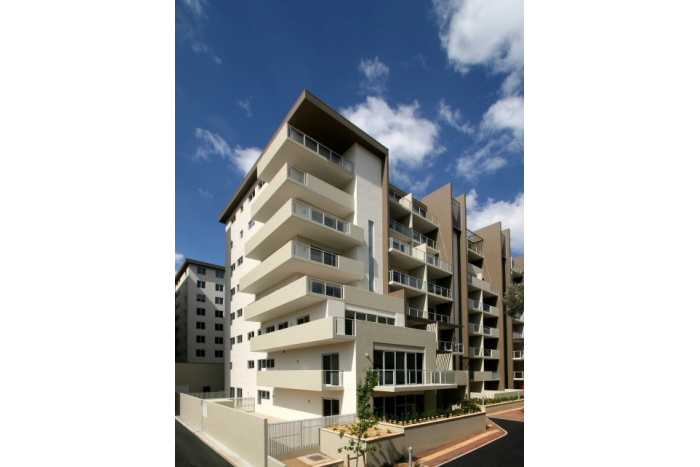 The residents of Monarch have the privilege of an intimate lift foyer that is shared with only one other apartment. The lifts have rapid response time, which is important during peak periods in large complexes. The external aesthetic of the building was formulated around the notions of base, middle and top, a concept that is pivotal to high rise building design. The base was formed through the use of solid columns and black toned back glass, which frame the front entrances. The mid section of the Monarch invokes interest with a mixture of glass and solid balustrade sections. Formidable dark blades run through the centre of the building elevation, and partially through the top. These blades function as a visual separation between apartments and also perform a strong as an aesthetic on the façade. The fire stairs are located between these blades, whilst continuous frosted glazing runs through the centre. 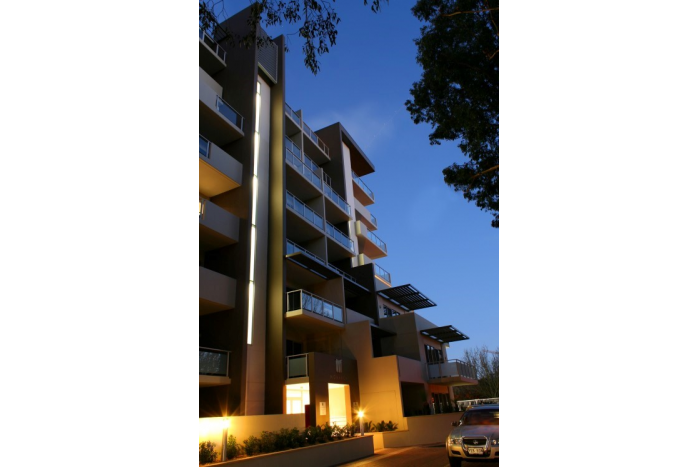 In the evening the fire stairs are illuminated, causing these vertical elements to glow, creating a stunning effect to the street. The two signature towers of Monarch address each of the connecting street fronts; one makes reference to David St, the other to Northbourne Ave. In keeping with this reference to the street scape, each building is scaled slightly differently to maintain a dialogue and relationship with each street. Unit addresses correspond with street signs, such that visitors experience a clear understanding of the programme of the complex. 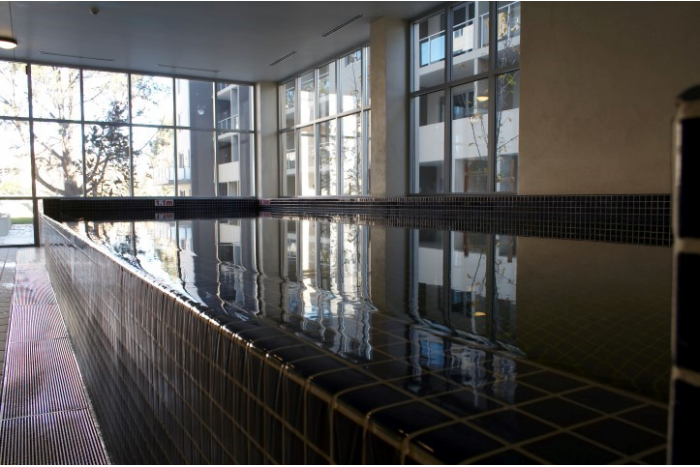 The difference in scale between the two buildings allows for an extensive internal courtyard, which contains an indoor swimming pool, gym and picturesque landscaped gardens and water features. The landscaping was designed such that occupants in apartments above would enjoy an intense outlook of both colour and pattern. The Monarch was planned and constructed around some existing significant trees. 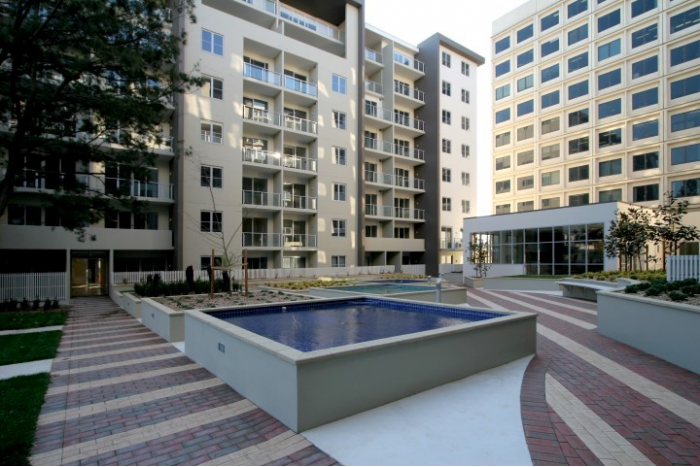 One particularly notable tree was retained in the internal courtyard, and now provides welcome shade for residents. The Northbourne avenue and David street frontages still retain the exiting trees, that present the impression that the buildings has a permanence and unobtrusive character.